Edinburgh 35 in a rare outside appearance on the Depot Fan at Crich during Enthusiasts Day 2008 on 27th September. Edinburgh 35 (or City and Royal Burgh of Edinburgh 35, to give it it's full title) is one of the last of the domed roof Ediburgh standard cars to be outshopped from Shrubhill Works in 1948. Another tram that on all accounts should no longer be in existence, it replaced similar tramcar 225 which was involved in a serious accident just two months before the abandonment of the system in Edinburgh in 1956. This meant that it had a short working life in the Scottish Capital of only eight years, but it was of course set aside for preservation. Initially it was displayed in a small museum within the old Shrubhill Works, but unfortunately that had to close, meaning that the tramcar languished for several years. In 1983 however, it was sent to Blackpool where it remained until 1988. During 1985 the tramcar participated in Blackpool's Centenary Celebrations along with many other preserved tramcars, some from Blackpool, but many from other systems in the UK. After leaving Blackpool the tram returned to Scotland to participate in the 1988 Glasgow Garden Festival. It was sponsored by British Gas who originally wanted the car to be in an all over advertising livery, but after much discussion it retained it's Edinburgh livery and gained small adverts on the side of the tram, which it still carries to this day. Once the event was over, the tram came to Crich where it has been ever since. It has never operated at the museum, with the exception of a short test period, and can now normally be found at the back of the main tram depot where it awaits a major restoration. In recent years the tram has been a subject of much discussion as to the future of it being at Crich. For a long time many wanted it to return to Edinburgh for a proposed new transport museum. 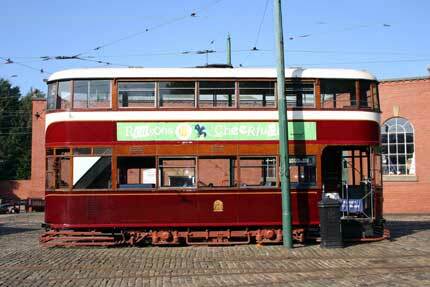 The tram was indeed still owned by Lothian District Council, and had the museum materialised it may well have departed the National Tramway Museum by now. But, after 10 years of discussions, the tramcar was transferred to the ownership of the TMS in April 2008, and it's future at Crich now seems a lot more certain. Popular with many enthusiasts, the tram has been "out of the depot and into the light" on several special occasions, and many hope that one day it will be returned to service in the operational fleet.